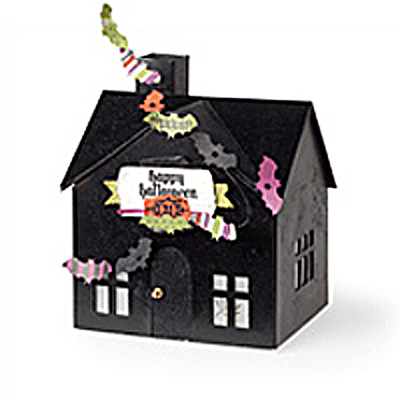 Below is the HALLOWEEN HAUNTED HOUSE designed by Stampin' Up last year - products to make the house can now be purchased at Stampin' Up's Clearance Rack. Items are selling out FAST, so get your ONLINE order in today by clicking here and selecting me as your Demonstrator when you create, or login to, your ONLINE account. If you already have an ONLINE account, you can select me as your demonstrator by going into "My Account", then "My Demonstrator", then "Find a New Demonstrator". Please note that if your order is $150 or more; you'll want to email me your order to get the Hostess Benefits associated with a qualifying workshop order. I'll process your order and get it shipped directly to your home hassel free! If your order is less than $150, you can order online and now get a REDUCED shipping charge! The charge for shipping is now $6.95 (minimum) or 10% of your total merchandise purchase; it's nice that Stampin' Up reduced this for ONLINE orders! If you have any questions, please feel free to contact me. And don't forget about my Frequent Buyer Program here.